141. Letting go is different from Giving up! 142. When I resist changes, I suffer more. 143. How we name something/someone reflects how we see something/someone. 144. We need to learn and forget. Forget the old and useless stuff. 145. No matter what people say about you, it is still not you. The following is the schedule for my training programs in 2008. This year, there are 9 new programs and 6 updated and relaunched programs. An exciting year! Unlike many other speed reading programs in the market, this one is super! You only spend 2 hours with me and you are guaranteed an at least 50% increase in your reading speed! Guaranteed! The world is changing so fast and you will be lagged behind if you can't keep the pace in absorbing the new information out there. Just 2 hours and you change your life. You become a sponge-like super absorber of information and knowledge! Status: Fully booked. Over 120 attended and learned how to speed read at their best!!! All new stuff! You can't find them elsewhere! Every skill you learn is gold! Registration: Email me at ask@keithto.com. HK$8,800 only if you register before end of December! Price will 100% go up after Jan 31 2009! A new 100-hours internationally recognized program. Very in-depth! Very comprehensive! This first class only available to our past graduates of RCC, RCaC or RPC Programs. You can upgrade to this new designation by enrolling the second part of the program, and of course at a great discount! My discount will never disappoint you. This program is much more than "openings" (if you know what they are!). It is about my model of Systemic Coaching. This program is at graduate diploma level and so expect serious learning. Apart from the face-to-face lecture hours, you need to complete another 500 self-learning hours in order to graduate. Pre-requisite: Registered Corporate Coach, Registered Personal Coach, or Registered Career Coach + Coaching Exellence. This is a new 8-hours Free Personal Development Program for 2008! A transformation program for your mind. Instantly effective! I used it myself. You learn and you enhance your mental power, all at the same time! 5. Updated & Relaunch: Unlimited Failures Program 無限失敗學: I am not able to teach you how to be more successful, but I can share with you some bits and pieces of Failing Less! This is a program of Successful Failures! No one can escape failures, but we can fail smart! Learning how to fail smart before one can learn how to succeed! Remark: Last time when I did this was 5 years ago. Next time? Might be another 5 years! Status: Program Completed. >70 enrolled! My new Free Business Development Program in 2008. You learn how to get Instant Upgrades continuously for your business! Not Business 2.0. You don't want drastic changes but dramatic effects! This is my classic Dream Interpretation Program. I launched this program more than 8 years ago and I only conduct this once every 3 years. You can learn my old classics, plus new added secrets in dream interpretation! How to Enrol: Email me at ask@keithto.com to reserve your seat. FULL! >120 registered! Sadly to turn down over 20 applicants! 8. New: Professional Handwriting Analysis Program 專業筆跡分析學課程: It is composed of our Foundation Course (12 hours) plus our New Advanced Course (12 Hours). Nobody in Hong Kong will teach you so much about handwriting analysis. Just ask our graduates of the 2005 Basic Course for how much they learned. Foundation Course Started! 70 Enrolled! Level 2 Course: Course Started! Full! 9. Systemic Thinking Course 系統式思維學: I promised to do it again in 2007 but I just do not have the time available. I will do this in 2008. You will learn how to think systemically. It is not systematic thinking or systems thinking. It is more than these. Status: Program Started! 55 Enrolled! 10. Systemic Personality Typology Level 2: You must be our graduates of the Level 1 Program (Fate Reengineering Workshop). You will go much deeper into MBTI and Enneagram, 2 more exciting and accurate Typologies, 1 very systemic methodology to fully understand people's personality. BTW, you are going to use all the above to go nearer to your Self-Realization and Individuation! 11. NLP Master Practitioner: Our only-once-2-years Master Program. Very intensive, extensive and in-depth information! You are going to master both NLP and yourself in this very advanced program. I can assure you that this program is much more advanced than most Master NLP Practitioner Program and NLP Trainer Program. Be prepared to learn something difficult, but very useful. This is a Master Thinker's Class! Time: 7:30pm-9:30pm for weekdays, 2:30pm-7:30pm for Sat, 12pm-7pm for Sun. Open for Enrollment for individual modules Now! 12. Our Core Program: NLP Practitioner: Our flagship program since 1998! Many graduates said that they learned even more from our Practitioner Program than others' Practitioner + Master Practitioner + NLP Trainer Courses, all together!!! Status: Open for Enrollment for individual modules Now! Call 2835-4394 Richard Fung for more details. 13. NEW: 潛意識重整工程 Level 2: Master of Subconscious Reengineering: Newly designed and newly added program! Mightbe only done once and never again. You are going to learn at much greater depth of those Subconscious Projection Tools we used in the Subconscious Reengineering Program, plus 5 more additional skills to explore more on what's inside your subconscious. It is going to be a small class, as I only intended to use my own office as classroom! So, everyone gets more chances to ask questions and to be analyzed by me. Upon successful completion, you will be awarded our Certificate of Subconscious Projection Analysis. Prerequisite for Enrollment: Must be graduates of our Subconscious Reengineering Programs. 14. NLP Essentials (Free 10-Hours NLP Training): You are going to learn all the essentials of NLP that you can't find elsewhere! You must enroll early! In the past 3 years, we conducted 2 courses each year, each 500 people, all FULL! The very best and intensive professional coaching course you can ever find. Over 600 graduates in the past 6 years! Status: Program started. Over 70 enrolled! Want to advance your career? Want to also help others in their career and personal development? Learn to be a Career Coach! Gain your designation of Associate Facilitator (AF) from the world well-known FacilitatorU with us! You are going to learn the 12 Principles of Process Facilitation and 120 Skills of Facilitation. 20. WABC Roundtable Meetings: Free programs for you to learn business coaching! In these 2 free sessions, we are going to talk about how to coach for changes in corporations or organizations. Status: Both Full, each with >350 Participants! 21. New: End of the Year Special Seminar: Free heavy-weight seminar for my friends who have supported me in the past, present and future. This replaces my Annual Prediction Seminar in the past years. Even more exciting information to be shared! 22. Think-Tank 2008: Free gathering of creative and not-so-creative people to use their brains together to create as many ideas as possible. Our record is 7,516 ideas in 55 minutes! Want to break the record again this year with us? Status: Program Completed! 8,107 ideas generated by classmates!!! How to attain your dreamed business or career? I will make you showing yourself how! Free for WABC members! Special fee for graduates of my major programs. BTW, also Free for graduates of the Level 3 Secrets Seminar. 24. Updated & Relaunch: Mind-Tech 1, 2 & 3: I haven't done this for over 4 years. I always want to re-do it but, you know, it is a matter of time availability. Mind-Tech 1 is the Scientific Meditation Workshop. You are going to learn how to meditate in 4 hours. No religious background. I meditate with this for 5 minutes everyday and this gives me a clear and sharp mind. Mind-Tech 2 is the Alpha Programming Workshop. You learn how to program your own mind at the Alpha State in a easy and fun way. Another 4 hours give you a collection of mental skills that benefit you your whole life. New: Mind-Tech 3 is my 100% new program. It is the Advanced Alpha Programming Workshop. Much more advanced Alpha Techniques are introduced in this new program. I will do this with my Personal Retreat 2009. Mind-Tech 5 is arranged in 2009! Status: Mind-Tech 1 >120 Enrolled! Thanks for joining us! Status: Mind-Tech 2 >80 Enrolled! Thanks for joining us! 25. Updated & Relaunch: Subconscious Re-engineering 潛意識重整工程: My most tiring program ever. This is also one of my relaunched programs of my "10 Years as Trainer" promotion. I had done this for 5 times in the past and I stopped doing it because it is too exhausting for me. You will learn to understand yourself much, much more through lots of Subconscious Projection activities. New stuffs are added. Remark: It is very possible that I will not do it again in the coming few years. Take it this time if you can. Status: Completed, 64 people enrolled! See you in the above new and exciting events! This is Part 7 of the Concepts 101 Series. In our life, we can respond or react to something happened, but we usually react rather than respond. 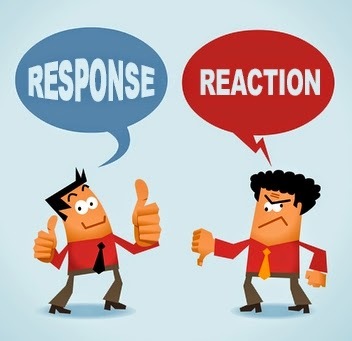 What is "respond" and what is "react"? From the dictionary, Respond is to answer or to reply, while React is to return an impulse or to resist. When something happened, we react when we do something without thinking. What we do is simply our instincts - automatic, instant, emotional for the goal of survival. However, when we respond, we think before act. We choose not to allow our instinctive, primitive brain to take over our human, logical brain to react. We understand in modern life, there are not too many incidents that can threaten our lives. We do not need to react to survive. We react when we consider the situation is beyond our control. We respond when we decide that we can do something to the situation. This is a difference between to surrender your input or to choose the suitable input. This is also a difference between surrendering your control and regaining control of the situation and yourself. You can also choose to answer, to explore, to accept, to acknowledge, to negotiate, etc. when responding. Reacting limits yourself to only one choice, while Responding opens up more choices! Earlier this year, I predicted there would be a crash in the stock market during May to July during my Annual Prediction Seminar. I was wrong. The crash comes in August! My estimation is that there should be a crash during middle of the year, so I said 5/07 - 7/07. I thought that this is pretty safe to predict like this. I sold all my stock in early May. I earned less but I suffered zero loss and worry! 1. Nobody can predict the future! 2. There is nothing called "safe" about the future. There are always risks. We can calculate the risks but we can never predict them accurately. This doesn't mean that we should do nothing. We do our best in estimating and then we go ahead. I just completed the Level 3 Secrets Seminar last Saturday. I am very glad to learned that our participants can improve their persuasion and influencing power using the material. 1. The seminar covers a lot of stuff. It is so packed that I felt exhausted but I also felt a sense of achievement after the seminar. You had demonstrated the mastery of the subject. I treasure the precious opportunity of learning from you. It is a great experience. Many thanks for your sharing. 2. It is an eye-opener, and I am looking forward to the Level 4 Seminar. 3. I found the seminar useful as there is many infomation on persuasion skills. It is very efficient to run through them in such a short period of time. 6. It is a great course and worth every pennies! As your other courses, this course provide a lot of valuable information and insights. One thing for sure is that I have got the key to persuasion! I am in a retail business, and some of the secrets are very relevant to the business. 7. 關於這個研討班, 本人得到了很多資訊, 有一些是新資訊, 有一些是平時都見過, 但好小留意到。 尤其是在您的舊電郵、舊課程單張上都可以見到你當日所講的, 這證明了內容是你平時一直有用, 睇到你今天的成功, 效果應是無容置疑。謝謝你的無私! 8. 感謝你創作及安排了這個超特別的課程 ! 感激你及你的同事為這個課程所做的每一伴事 ! 你的寶貴經驗及有心的分享使我獲益良多 , 既直接又實用 , 這是我最喜愛的課程 ! Thank you for all of your valuable feedbacks. 1. They can't see their choices. The causes can be very complex. They might have blindspots. They might have too few points of views (i.e. positions, angles, frames...). They might have rigid beliefs. I will talk about them later. 2. They have not "see" their choices. They just thought, believed and decided that they do not have choices. We can't see any choice if we do not intentionally find them! Everything starts with our Beliefs. Then we go through our Thinking>Feeling>Acting Process. Our beliefs are products of our Past Experiences. They are so difficult to identify and change. However, every point of your Thinking>Feeling>Acting Process can be a Point of Choices. Stop, check and you will find your other choices! Once you find and adopt a new choices of thinking, feeling or acting, you are going to have New Experiences of thinking, feeling, acting and results. These New Experiences can then update your existing beliefs. Simply by choosing a new choice, you can get new results and an update of your beliefs. Today is a typhoon day. So, I went to a supermarket to buy some food for dinner. The whole supermarket was filled up with people. There were well over 200 people queuing up in the "Fast Lane" (you can get faster check-out service if you buy less than 10 pieces of merchandises). When I took a look at the "normal" lanes, only around 10 customers per line. I just asked myself why those people in "Fast Lane" didn't went to the normal ones. Because they all thought that it should be faster in the "Fast Lane"! This can be true during normal days but not today. Of course I lined up in the "Slow" lane. Then one more cashier opened and several people in front of me went to that cashier. I just waited for less than 5 minutes! During a typhoon, everybody is so eager to go home. No one will buy a lot of stuff today. Even in the "Slow" lanes, people were buying a few pieces of items only. This reminds me of my work as a coach. We help people to identify their blind spots in thinking. Why do people having blind spots? Things change under different situations but we are not aware of it! Don't assume. Think before act. It saves time and effort! When we are doing Inner or Age Regression, the most important factor governing its success or failure is whether the client is regressed back to his/her ISE, the Initial Sensitizing Event, i.e. the very first of his/her past experiences which lead to the problem. How can we tell it is the ISE or not? We have a lot of verification procedures to check. But even we check, we still cannot 100% ensure that it is the ISE! However, all ISEs have a common characteristics. It must be related to a Primary Emotion. It can be Fear, Anger, Sadness and/or Disgust. When we could not handle the ISE at the time of happening, the emotion could then be further complicated with Subsequent Sensitizing Events (SSE) appearing. As a result, Secondary Emotions like boredom, annoyance, grief, remorse, jealousy are thus evolved. The more serious and persisting problems usually have an ISE of Fear or Anger. Fear and Anger are the 2 emotions directly related to survival. This makes the problem so long-lasting. It is our basic instinct to survive. A persisting problem can be seen as a misunderstanding of threats to survival! When you regress someone to ISE, check whether the emotion is primary or secondary. This saves the therapist's and the client's time and effort. 1. Do we need to explain Inner Guide in Pre-Talk before doing so? Yes. This is a selling process. The concept of Inner Guide can make some people feeling strange. It looks very "Mew Age", though it is not. We discussed Jung's theory on Archetypes in the same module because we can use Jung's Archetypes Concept to explain to our clients about Inner Guides. 2. Do we need to use the 『下次更深入暗示』every time we hypnotize a client? When do we put this suggestion? Yes. We do it every time. It take us less than 10 seconds to say such suggestion but it can make the process easier for both the client and the therapist in the next session. Why not? When to put the suggestion? Just use logic. When is the best time to tell someone it will be easier and faster to get to somewhere? Choose you choice and email me your selection at ask@keithto.com. I will explain it further to you. 3. When I asked for name of the Inner Guide, he said that it was not necessary and he was always there. What can I do? What is the aim to ask for the name? Easier to find the guide later! Then, ask him/her how the client can find him/her again in the future. 4. During Post-Hypnotic Suggestions, can we buy time by asking the client to repeat the positive messages or what he had learned by himself? No. Why we repeat the suggestions? Because the clients are not having a very deep imprint of these newly learned beliefs inside their minds. We want to deepen the imprint by repeating. If these beliefs are not deep, can the client repeat them by themselves? No. So, it is our job to repeat for the clients! Hope you all get something from these Q & As. 1. Never change the history, you will never know what changes it will create in the future! 2. There is always a reason in the past to your current problem or success. 3. Sometimes, just a small change matters a lot. Do we use Leading Suggestions in hypnotherapy? Many of you knows that I strongly disagree with the use of Leading Suggestions. This can mislead the clients, causing false memories and confusions. This harms more than helps! However, if we do not use any leading suggestions, we simply cannot hypnotize anybody. Induction, deepening and all other hypnotic techniques are done through leading suggestions. For example, when you say, "As you close your eyes, you feel more relaxed", this statement is a leading suggestion. We use lots of leading suggestions in the Process to guide our clients going through it, while we should not use any leading suggestion for the Content within the Hypnotic Process. For example, we will not suggest clients reviewing any particular experience or seeing any particular person during Age Regression. These are leading suggestions for the content. But we will guide our clients using leading suggestion to the first time of having such feeling in Age Regression. This is the Process of Age Regression, not the Content. 136. When you trust yourself, others follow. 137. When I start to do, things start to be done! 138. Everything happened in the past, good or bad, nourish you if you learn from them. 139. Good manner starts with myself. 140. How you see others is how you see yourself. Minimalism describes movements in various forms of art, where the work is stripped down to its most fundamental features. The design is reduced to the only necessary elements. I like to apply Minimalism to all of my works, particularly hypnotherapy and coaching. Only necessary elements are retained, all others are stripped down! The world is already too complicated. If you want to work faster, easier but effectively, Minimalism might provide the solution. 1. Minimal Words. I deleted all unnecessary words. I use those proven-to-be-effective words again and again. This makes it easier for me and for the clients. They do not need to understand so many complex words and instructions. Artful using of very basic choices of words can be as effective. 2. Minimal Steps. I deleted all unnecessary steps. Many steps are just decoration or stuffing without any function. This results in briefer process and faster outcomes. 3. Minimal Interventions. I do not intervene because I want to intervene. I only do the necessary interventions. It will be less misleading and less works for me and for the clients. 4. Minimal Interpretations. I do not interpret what the clients said. I do not paraphrase. These just hinder the discovery process of the clients.